Everything you need to know about the weeping willow tree, from identification tips to typical characteristics; how to spot disease and the best way to maintain a willow tree. There are around 400 species of willow tree, known in Latin as Salix meaning ‘sallow’. Generally when you hear mention of a willow tree, you tend to naturally think of the ‘weeping willow’, or Salix babylonica. The long, elegant trailing branches that are characteristic to the weeping willow tree swish gracefully in the breeze, providing a much welcome haven for shade-seekers and wildlife alike. The weeping willow is an extremely fast growing tree that has a long history in Great Britain and, despite it having originated in China, is now very prevalent nationwide. It is one of the UK’s largest weeping trees and the sight of a weeping willow looming magnificent over a glistening lake has become quintessentially English. Appearance Striking and unmistakable in appearance, the weeping willow sports attractive trailing branches and a distinctive rounded shape. It will usually be found alongside water. Leaves Elongated, narrow leaves, green on the top and white on the bottom with a fine toothed margin. Leaves transform through green when they appear in the spring to yellow in the autumn. Flowers Yellow flowers appear in early spring. They are small and appear as catkins. Their richness in nectar attracts an abundance of insects. Fruit Edible fruit is smooth and oval Once the catkins are pollinated, they develop into 3mm long, brown, conical capsules. Found in Wet, boggy locations such as beside lakes, ponds, rivers and streams; popular in parks, maintained gardens and larger domestic gardens. Willow trees offer abundant shelter for wildlife. The flowers of the weeping willow produce ample pollen and nectar and so are a favourite for bees, butterflies and moths. Birdlife thrives on caterpillars which are particularly beneficial for baby birds. The cascading branches provide refuge for nesting birds from predators, which will also turn to the tree’s leaves, twigs and seeds for sustenance. Woodpeckers are attracted to the borers that the willow tree is a haven for. Deer are partial to weeping willows but being a hardy tree, the willow rarely experiences permanent effects from the nibbling. Various animals including rabbits and squirrels are attracted to the weeping willow, particularly those that provide hidden shelter by way of craggy cavities. The willow tree has long been associated with metaphysical and ritual practices. Willow wood has been used throughout history – and still is – for psychic enhancement ceremonies. Due to its association with water, the willow tree is connected with magic and power. The Greek goddess of witchcraft, Hecate, used willow wood to make her wands, whilst Orpheus, the bringer of song, used the wood as a talisman against evil on his route to the underworld. The harp that Apollo gifted to Orpheus was also said to be crafted from willow. Dating back to 1583, William Shakespeare’s Willow Song in Othello is possibly the most famous literary reference to the willow tree. The Baird mentioned the tree again in Hamlet and Twelfth Night and Harry Potter author J.K. Rowling’s Whomping Willow is the well-known keeper of the tunnel that leads to the Shrieking Shack where Professor Lupin secretes himself during his transformations into a werewolf. Willow trees produce a milky sap which contains salicylic acid which is used to make aspirin, an exceptionally important pain relief drug used worldwide. Years before aspirin became commonplace, people would chew willow bark to treat fever, inflammation and pain. Willow bark, often taken as a tea, continues to be used as an alternative remedy for a number of health issues to this day. 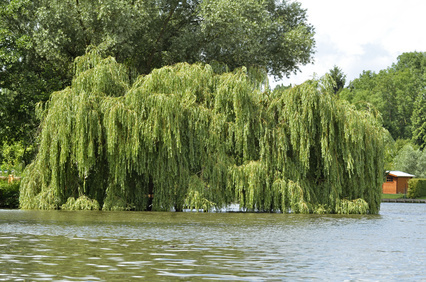 The willow tree’s natural ability to absorb large quantities of water makes it ideal for planting in flood prone areas or where drainage is required. Willow wood is used to produce a vast array of items including cricket bats, furniture, toys, fishing nets, baskets, musical instruments and broom handles. The willow is a very important tree! Willow trees are fast growing and benefit from regular trimming of the hanging branches so that the area underneath the tree can be enjoyed as a shady haven, and so that it can be more easily maintained. 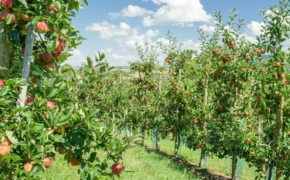 Shaping and pruning in the tree’s early years is essential to create a strong structure that will pretty much look after itself in maturity, aside from branch trimming, dead wood and lower branch removal and taking out any suckers. You can read more about willow tree pruning here. 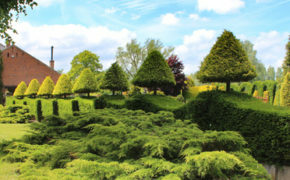 Willow trees tend to grow to substantial heights and widths, which means willow tree pruning and branch trimming should be left to professionals who are trained in safe working at height, particularly if the willow tree is located close to a body of water. In addition, the willow tree is prone to a number of diseases and pests such as crown gall and willow scab, and it will often take a qualified arborist to identify whether something is not right. Early detection is vital if the health of the tree is to be maintained. If you have a willow tree on your land that needs expert care, why not talk to T.H. Tree Services? As fully qualified and highly experienced tree surgeons, we can offer comprehensive knowhow across all aspects of willow tree care. For a free, no-obligation quotation, give us a call on 01268 642814 or get in touch here.